Kay Carter grew up in Juda, WI and graduated from Juda High School. She attended what is now UW-Lacrosse and graduated with a BS in Physical Education and English. Her first teaching job was at Oconomowoc High School, where she taught physical educations classes. After 5 years, she moved to what is now UW-Stout in Menomonie, WI. She taught general physical education classes initially, and then for 20 years, taught First Aid and CPR. While at Stout she obtained her Master’s degree in Education from UW-LaCrosse. Also while at Stout, she started the first competitive gymnastics team and served as women’s athletic director during the development of the women’s athletic conference, WWIAC, which later became the WIAC. Kay retired after 35 years of teaching and coaching and returned to the Juda area. Looking for something to do, she became an ambulance driver for GCEMS and also served on the Board. Kay is a member of the Juda Zion UMC where she is a member of the choir, serve as the financial secretary, and coordinator for Family Promise. Kay also volunteers with the Monroe Clinic Hospice Pet Program with her dog, Emma, and the Monroe hospital pet therapy program. She has been a member of the Green County Relay for Life survivor’s team for several years. Kay says she hopes that she can continue to contribute to GCEMS as a member of the Board. Brad Casper lived and grew up on a farm near Dodgeville with his four siblings. His family still lives in the area. Brad attended Edgewood College and graduated with a pre-medicine liberal arts degree (biology degree with emphasis in medical science) in 2001. He received a CNA certification and worked at hospitals and medical centers in the Madison area while in college. In addition, he has training and experience with the physically and mentally disabled. Brad started working in management for Pizza Hut after graduation in the southern WI areas of Richland Center, Dodgeville, all over Dane County, Janesville, and Beloit. He moved to Monroe in May 2007. Brad and his wife live and work in Monroe, and their daughter goes to school here as well. Brad is a firm believer in community support, relationships, and involvement. He has worked with many nonprofit organizations over the years, such as the United Way, Relay for Life, area schools, etc. He says he is looking forward to what the future brings. Steve, a member of Monticello Fire & Rescue since 2007, decided there was more he could do to support the local communities and joined Green County EMS in January 2009. Steve grew up on a dairy farm in Washington Township in Green County, and graduated from Monticello High School. Steve has been employed in the concrete construction field since it was his summer job while attending UW-Whitewater. He currently is invested in Ronek Concrete operating out of Evansville, WI. Steve was elected to the board for the first time in May, 2014. He is the father of three active & vibrant school-aged children, currently residing in Monticello. He is an active member of Washington Reformation Church, serving two terms on the Consistory (church's board). He has been constantly upgrading and advancing himself since becoming a member of Green County EMS. Steve was part of the most recent class of members to advance to the Intermediate level. Steve enjoys being a part of the EMS system and says, "It is extremely rewarding to be a part of this of this organization. I find a great deal of self-satisfaction by joining a group of people whose sum is greater than it's individual parts. The people within Green County EMS, and all of the emergency system, have become another branch of my family." Ann is a native of Monroe and graduated from Monroe High School and the University of Wisconsin, Madison with a degree in Mathematics. She is currently employed at Colony Brands where she has been employed for over 30 years. While at Colony Brands, she has been a programmer and is currently working as a Senior Manager in the Contact Centers. She joined the Board of Directors for Green County EMS in May of 2006 and became Board Chair in May of 2010. She has also taken part in Green County Leaders and Dale Carnegie. Ann is active in Family Promise and a member of Grace Lutheran Church where she is currently chair on the staff support committee. Ann and her husband, Joe, currently reside just outside of Monroe. Mike grew up in Brookfield, WI and graduated from Marquette University High School in 1984. He graduated from UW Madison with a Bachelor of Science in Economics in 1992. Mike is currently co-owner, with his wife, of Spare Time Technologies, LLC, dba Paw Prints in Monroe. Paw Prints is a wholesale and B2B, screen printer, embroiderer, and producer of digital graphics. Mike is a former Grand Knight of the Knights of Columbus Council here in Monroe. For the past 10 years, he has been chairperson of the Green County Fair Concessions for the K of C. For those same 10 years, he has been active in the organization and execution of Concerts on the Square. Mike is involved in the Balloon Rally, heading up the beer and wine sales. He currently sits on the Fund Development Committee for Family Promise of Green County, and the St. Victor’s Mardi Gras committee, and act as the emcee for both their major fundraisers. Mike and his wife also work with Everyone Needs a Home (ENAH), an animal welfare organization working in Green and Lafayette Counties. They warehouse and host the monthly Pet Food Pantry for ENAH and have since its inception in 2011. Mike says he’s excited to now be a part of Green County EMS. Dennis has served as a Community Advisor for two years and is currently serving in his second term on the board. Dennis lives in Juda where he has been a First Responder with the Juda Fire and Rescue Department for over 15 years. Along with being a First Responder, he has also been a State Certified Firefighter for over 17 years. Dennis has served the department as their Treasurer for over 10 years and is the Secretary/Treasurer for the Juda and Community Fire Association, the governing body of the volunteer department for over 10 years. As a resident of Green County and as a First Responder who works with the Green County EMS on calls in the Juda area Dennis sees the value in the services offerered by the organization and is committed to seeing it continue to thrive. Colleen Rear started her medical career with Argyle EMS in 1993. She joined GCEMS in 2002 in order to continue to assist the surrounding community as well as Argyle. Having worked at a local factory for 11 years, and losing her job to closure, she took a different path in life and became a registered nurse in 2009. She has worked in the Monroe Clinic Emergency Department since shortly after becoming an RN. "I strive to give the best I can to my community by my choice of profession and advancing my level from EMT Basic to IV-Tech, and now to Intermediate (99)." Colleen also teaches Basic Life Support CPR, Pediatric Advanced Life Support, and Advanced Cardiac Life Support. "It is a great honor to be able to serve and assist my community when they are in a time of need and look forward to continuing my career, my passion, into the future." Carrie has been a member of GCEMS since August of 1975. Currently an EMT-Paramedic, she is also a Registered Nurse having worked at the Monroe Clinic for over 35 years; 20 years in the Emergency Department. She has held many positions within the organization including President, Vice-President, Chair of the Board of Directors, Vice-Chair of the Board, Secretary of the Board, and many committee chairs. She has also been the recipient of the Green County Quality of Life Award and the American Heart Association Wisconsin BLS Instructor of the Year. Other activities include being an American Heart Association BLS Instructor and an Affiliate Faculty with Blackhawk Technical College for many years. Many changes have involved EMS over the years and I am proud to be associated with a volunteer organization that has willingly advanced their level of service, to Monroe and the surrounding communities, from EMT-basic to the Paramedic level. Russ was elected to the Green County EMS Board of Directors in May 2008. Russ is a civilian member of the board and is retired from the City of Monroe Police Department. He has worked for the Delavan, WI Police Department and the Beloit Township Police Department. Russ graduated from Blackhawk College in 1975 from the Police Science/Criminal Justice program. Russ lives south of Juda, WI with his fiancée, Susan. He has grown children with seven grandchildren and one great grandchild. Russ has worked with many fire and EMS departments and is always interested in improvements that can be made to better improve service to the public. Russ is always interested in your thoughts, and welcomes you to contact him any time on how to improve Green County services. Russ welcomes you to join Green County EMS for a very rewarding experience. Cindy has been a member of GCEMS since March, 2006. She is currently an EMT-Paramedic. Her current position is the Public Information Officer and has held this position since May, 2011. She has her certificate in Public Information from Green County Emergency Management. Before becoming the PIO, she was on the Board of Directors from May, 2007 - May, 2011 and held the Secretary position. She enjoys working with the public in both capacities of Paramedic and PIO. She lives in Monroe with her husband, Tim. She has two daughters and one granddaughter. Mike has been a Driver for GCEMS since January 2010. He was a member of the Board of Directors from June 2011 until June 2017 when he accepted the position of Equipment/Maintenance Officer. He has a Bachelor of Science Degree in Business Administration with a major in Management from Columbia College. Mike is employed at SK Plastic Molding Inc. as the Quality Manager. He is also involved with the Boy Scouts of America as an Assistant Scoutmaster for Troop 115 in Monroe and serves on the District level as the District Commissioner for Green, Lafayette, and Grant Counties. Mike makes his home in Monroe with his wife Mary and his son Bradley. Dan was hired as the EMS Chief in May 2006 after retiring from the Marine Corps. His last duty station was Marine Corps Air Station, Cherry Point, North Carolina where he served as the Officer in Charge of approximately 100 fire fighters. Dan is an EMT-Paramedic with over 40 years in fire and EMS, first becoming an EMT in December 1976. He earned a degree in fire science while serving in the Marines, and has been licensed as an EMT in WI, CA, and NC. A native of WI, Dan makes his home in Monroe, and is dedicated to continuous improvement and advancement of EMS services for Monroe and the surrounding communities. Mary Pilling has been a GCEMS member and EMT since 1985. Mary is a retired fulltime EMS Instructor for Southwest Wisconsin Technical College and is now teaching part time for Blackhawk Technical College. Mary is also Regional Faculty for the American Heart Association and teaches Advanced Cardiac Life Support and Pediatric Advanced Life Support classes for St Mary’s Hospital in Madison. Mary currently serves as the GCEMS Education/Training Officer. She resides in Blanchardville with her husband. 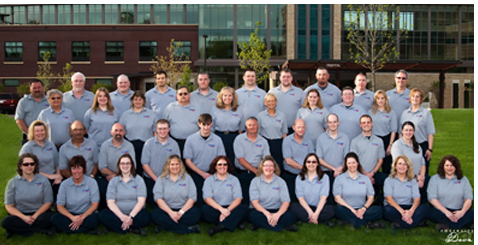 Being a part of the dedicated members of GCEMS has been a rewarding experience. The dedication of the organization to the needs of the community is immeasurable. Bev is an EMT Intermediate Technician with Green County EMS. She first started her career in EMS with Argyle Ambulance Service as a First Responder, and then an EMT-Basic. She joined GCEMS in 1999 and is currently the Assistant Chief. Bev works full time for Dr. Drew Delforge here in Monroe. Bev lives in Monroe with her husband Bob, who is a member of Monroe Fire Department and First Response. She has two sons and daughters in-law and five grandchildren. Bev is very proud of being a part of an organization that provides such an exceptional service to our community. Jeff started with GCEMS as a driver in 1999. He advanced to EMT in 2002. Jeff works full time for the City of Monroe Street and Sanitation Department. Jeff lives in the City of Monroe with his wife, Ann. Jeff is very proud of the organization and rewarding experiences he has received with GCEMS. Copyright © 2019 Green County Emergency Medical Service, Inc.